I made this for the Cards & Things Sketch Challenge. I got the idea for the rest of it on the way home from dropping my kids off at the library. I'm trying to do more challenges, so if anyone knows of any other favorite challenge blogs, please feel free to leave a comment with a link. I started off using Make-the-Cut. 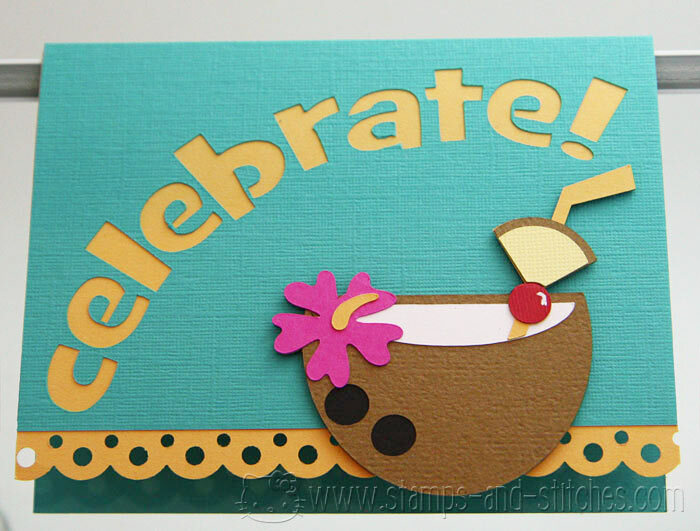 I used the Mahalo set from Lettering Delights to make the coconut drink. When I make a shape to go on a card, I make a card-sized rectangle in Make-the-Cut first and then I can resize the shape to the right size for the card front. Then I just delete the rectangle or turn off that layer when I cut. For the letters I used a font called Grilled Cheese. I added the letters to the mat, then I used the bezier warp thing to make them curve the way I wanted them. This was done mostly through trial and error since I don't really know how all the controls on the bezier warp thing works. I added some tiny rectangles to some letters and used boolean join so that I wouldn't have to deal with putting the center parts on separately, but I made a couple of them too small and had to deal with it anyway. Once I got the word all done and sized, I found that the lines on the virtual mat in Make-the-Cut don't match up with the lines on my silhouette mat. So I exported the svg and opened it up in Silhouette Studio Designer Edition to do the cutting-it was a little easier to make sure the text was in the right spot for my card front. Before I cut, I did a test sketch on some white paper to make sure I had it in the right spot. The card stock is all from Stampin' Up and Bazzill. I used a Sakura Gelly Roll pen to make a little shiny spot on the cherry. The bottom border was done with a Martha Stewart border punch. I made the blue card base about an inch short on the front, then I added the orange card stock (after punching the border) so that it could be seen through the cut-out letters and on the bottom. I could have sworn I had it centered when I punched it but maybe that punch doesn't center as easily as my other ones do. Or maybe I just messed up. Hey Gale, it's GREAT! So bright and fun and reminds me of summer coming on! Fab card! Such a sweet summer card, love it! I was goign to mention feline playful for challenges, but I saw that someone else already has mentioned it. It is fab blog for challenges.